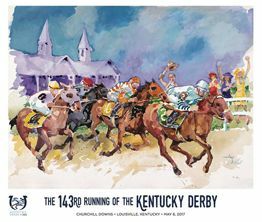 The field for the 143rd running of the Kentucky Derby has been announced. At the end of the race on Saturday, May 6th, 2017 only one of these horses will have a chance to become a Triple Crown winner. The early favorite is Classic Empire at 4-1. And right behind at 5-1 are McCracken and Always Dreaming. Trainers Steven Asmussen and Todd Pletcher both have three horses each in the Derby. My favorite is McCracken. He is 3 for 3 at Churchill Downs and I expect the streak to continue. Enjoy the race!